Rooms at the Post Ranch Inn boast million dollar views, rustic charm and an all-you-can-eat minibar. The soft product may not be the best ever, but with a setting like this it's easy to overlook. 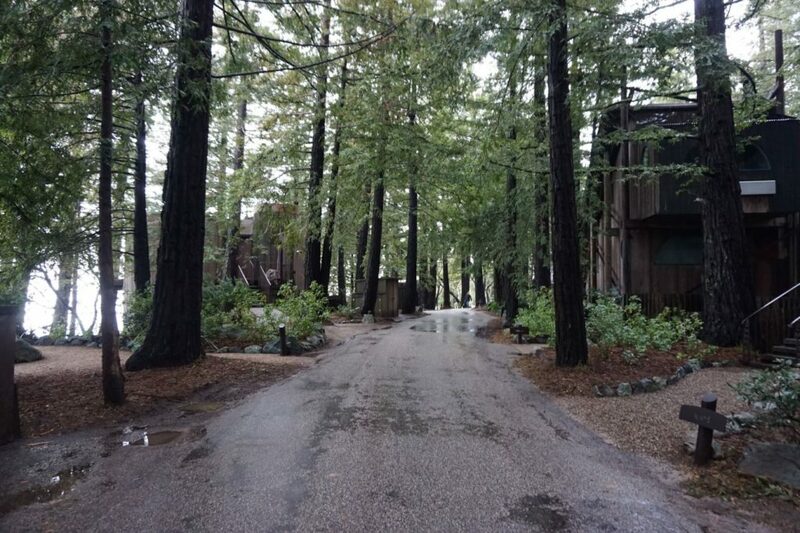 All the rooms at the Post Ranch Inn are located along a single-lane road up a hill from the reception area. The road is flanked by redwood trees, with one side facing the ocean, the other the mountains. 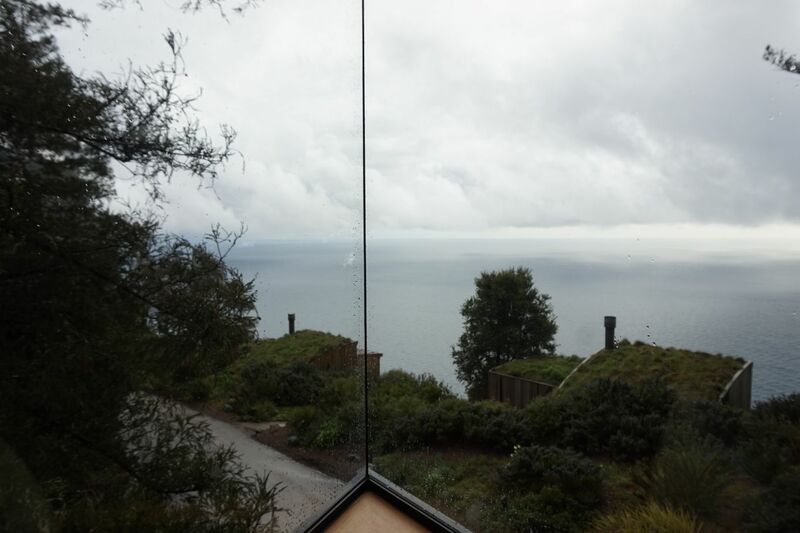 As you can imagine, the ocean-facing rooms are considerably more expensive than the mountain-facing ones. I had originally reserved an Upper Mountain House, but was eligible for a complimentary upgrade since I booked through the AMEX Fine Hotels and Resorts program. In the end, I got one of the three Tree Houses. 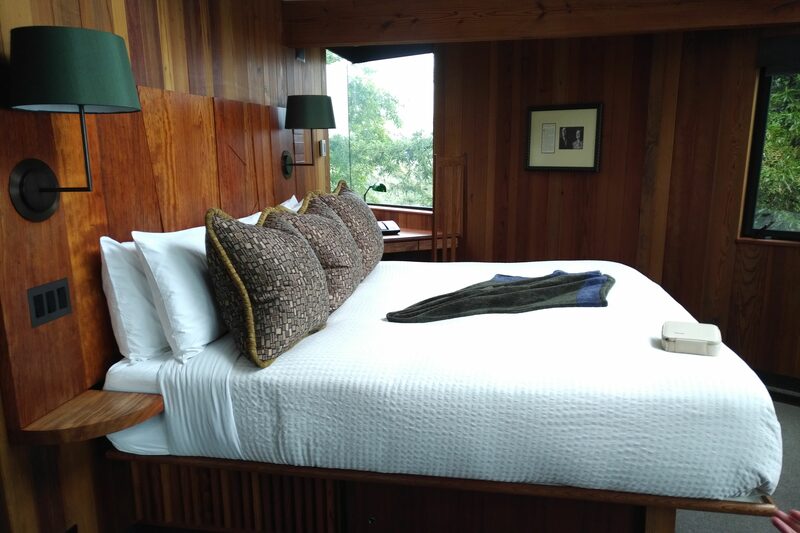 The difference in rates between an Upper Mountain House and Tree House is US$200 a night. The 40 rooms at the Post Ranch Inn are named after the founding members of the ranch. 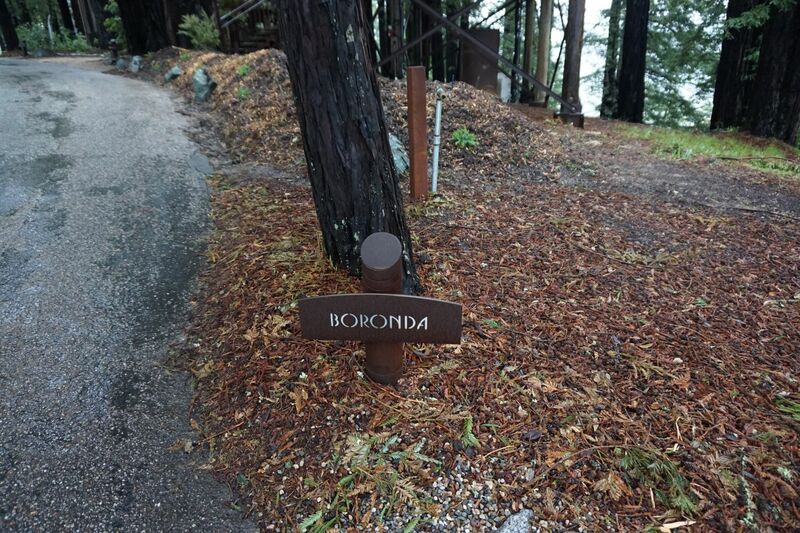 Our Tree House was named after Alejandrino Boronda, a Spaniard who worked as a cattle rancher in the Big Sur area. 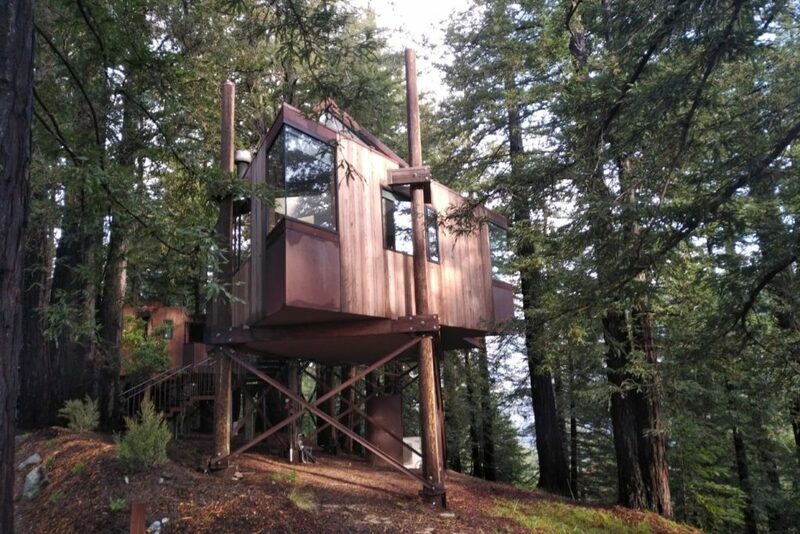 It sits on stilts nine feet off the ground in order to minimize damage to the roots of the redwood trees in the area and despite being on the “wrong” side of the road, it was high enough to afford partial ocean views. 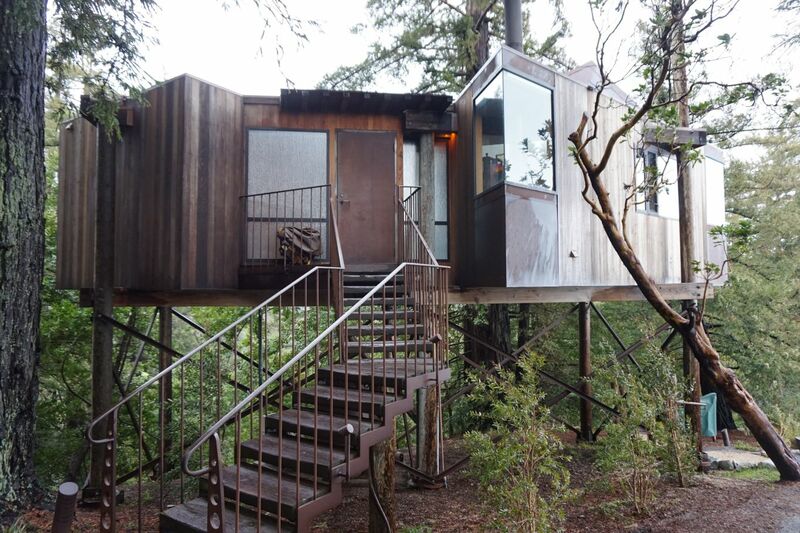 Post Ranch Inn provides the layouts of all its rooms on its website, and this one’s for the Tree House. A floor plan is no substitute for stepping inside, of course, so I’ll stop the teasing and show the photos. seamlessly with the scenic beauty of the outdoors. All that was definitely on display in the bedroom, which sported plenty of wood and tan colored furniture to match. There was also a skylight, although unfortunately we weren’t able to see any stars during our stay due to the cloudy weather. The King-sized bed boasts an organic mattress and linens (I didn’t even know that a bed could be organic). I’d say the fixtures and vibe of the room are very 1990’s. 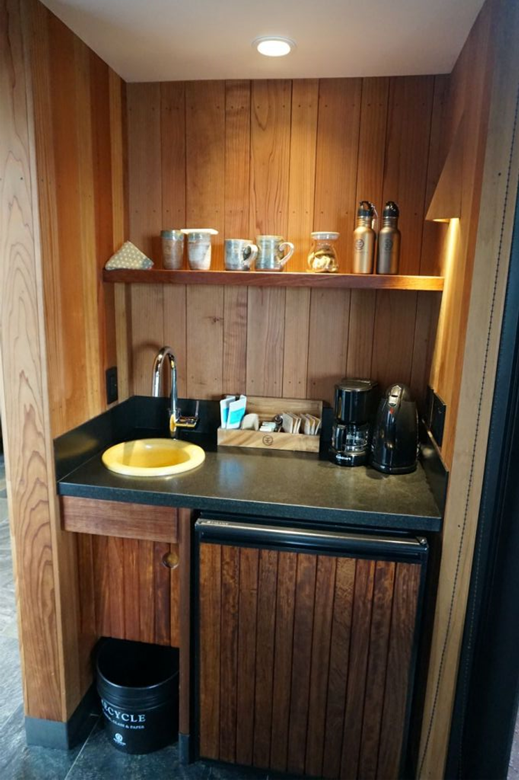 You’re not going to get the latest in cutting-edge design here, and it’s more rustic cabin than modern luxury. 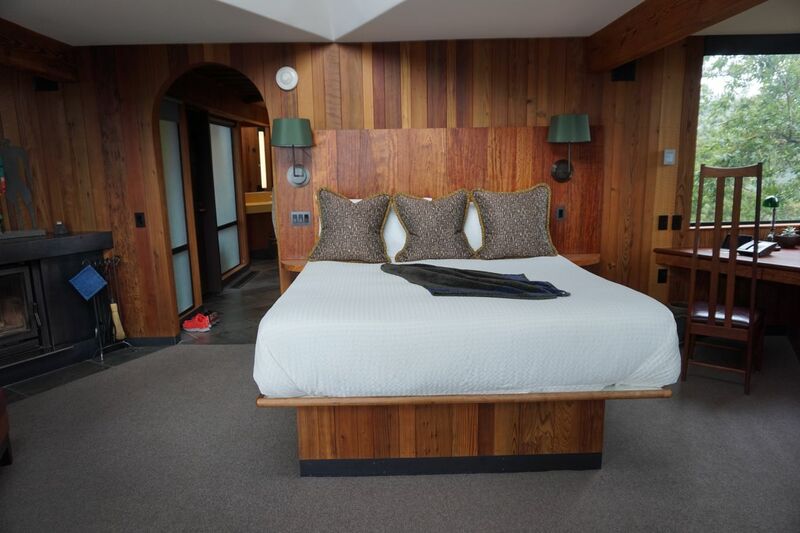 In accordance with the philosophy of the Post Ranch Inn, you won’t find any television or alarm clock in your room. 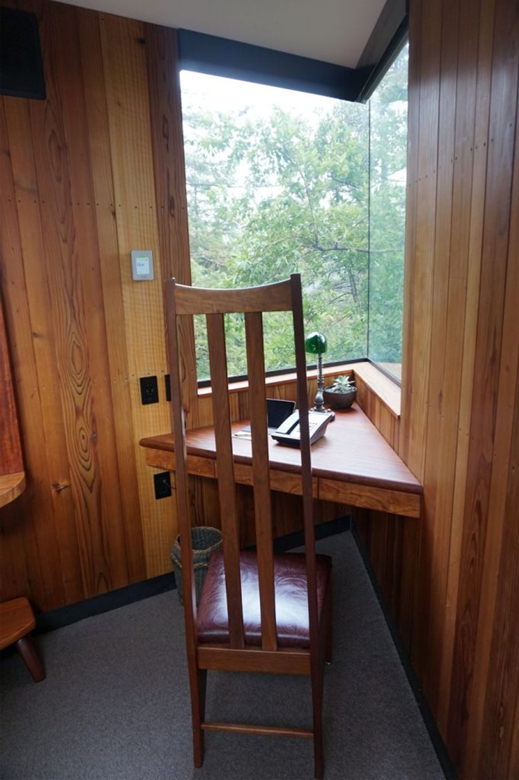 The sole TV on property is located in the library, and although there’s Wi-Fi, you’re encouraged to disconnect entirely. Let’s be honest: you’re not here to catch up on work. The tree house is triangular in shape, so it creates interesting opportunities for the use of space in the corners. 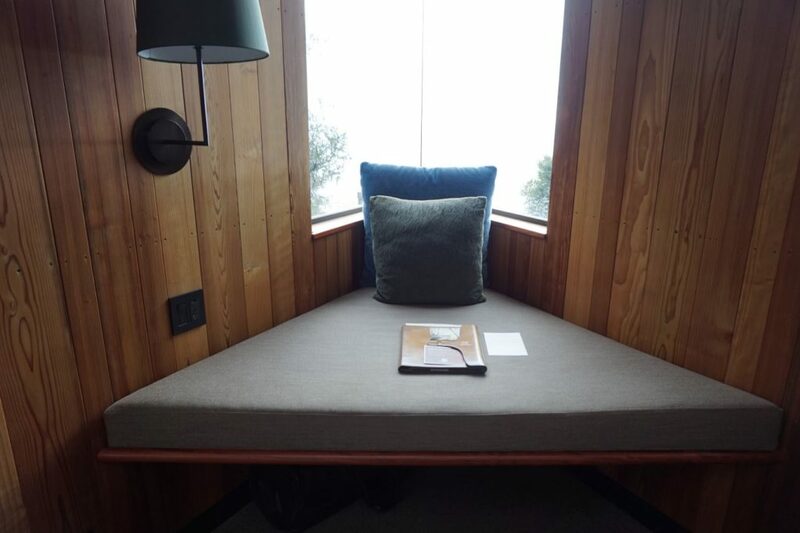 At one corner there was a window settee which looked out to the ocean. 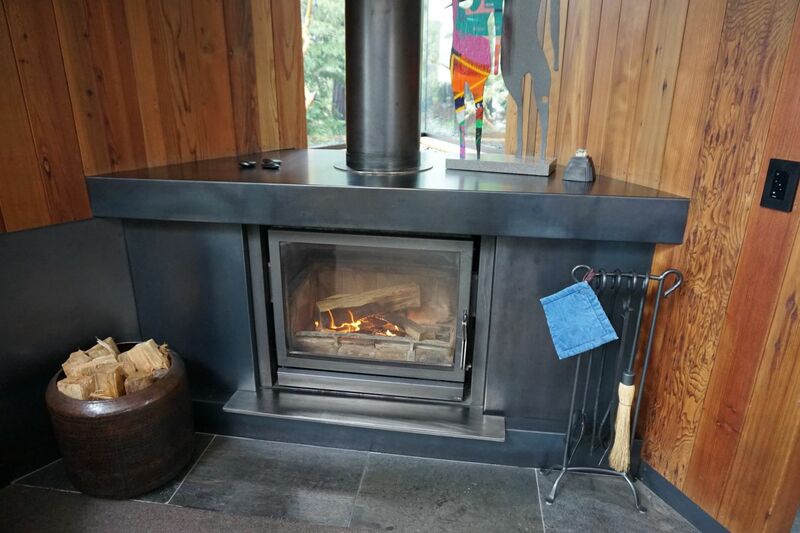 In another corner was the fireplace, with a stash of wood and fire starters. This was the perfect thing for a cold day, and I impressed The Milelioness with my ability to make fire (along with the wheel and other primitive tools). The final corner had the work desk, which looked out to the mountains. Although there’s no TV in the room, you’re not completely in the stone age. 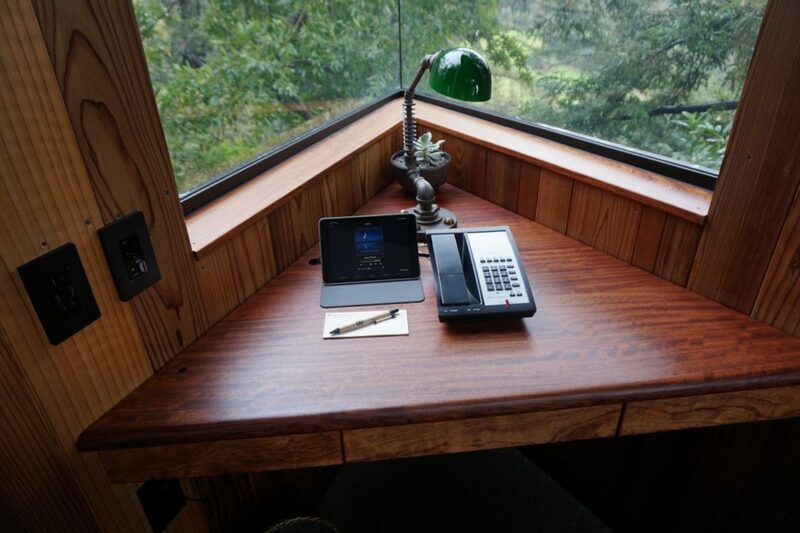 The room does have a sound system which is controlled through the iPad on the work desk. There’s also a Bluetooth dongle in the drawer that allows you to connect your own media device. When we entered the room, a relaxing Enya-esque soundtrack was already playing. I’m guessing that’s standard for new arrivals. 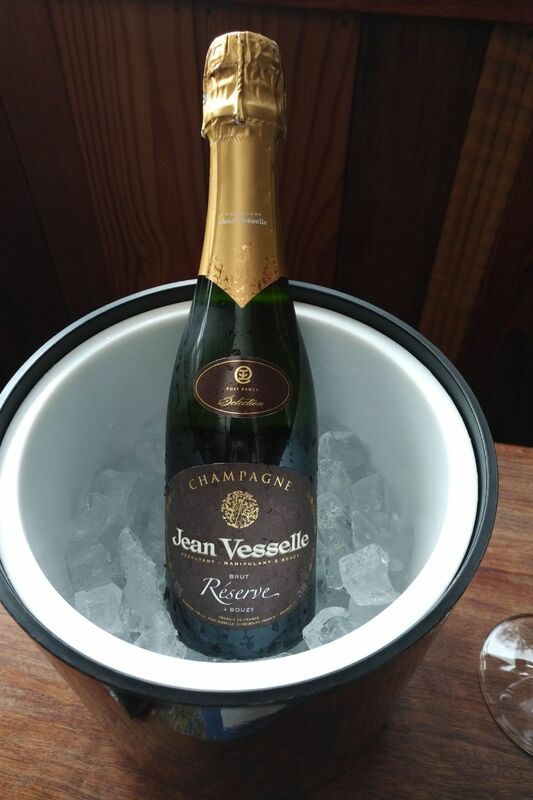 A gift of a half bottle of champagne on ice was waiting for us at the table, as well as a fruit bowl which was replenished daily. Post Ranch’s choice of champagne? Jean Vesselle Brut reserve, a mix of 80% pinot noir, 20% chardonnay. Honeysuckle blossoms tickle the aromatic nose, or so the tasting notes say. A half bottle retails for about US$20-25. 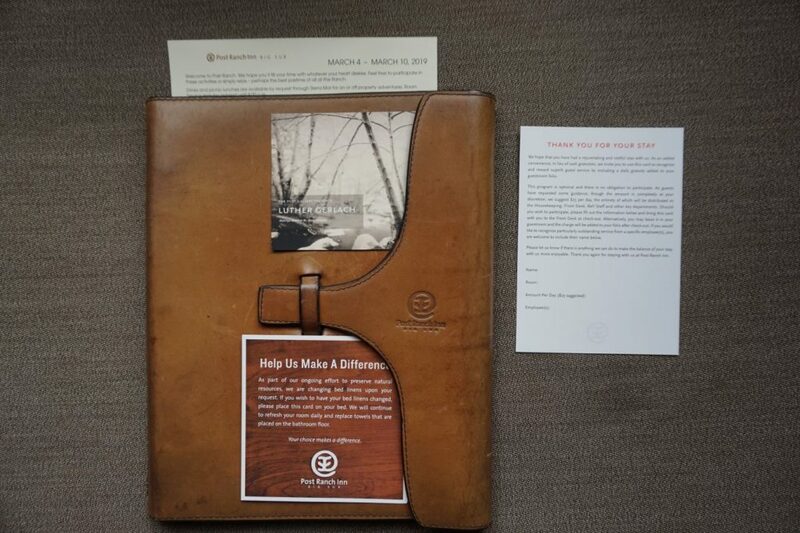 In the room we also found a leather folder which contained the room service menu, a list of activities for the week and some of the key policies for the property. A small note suggested an optional gratuity of US$25 a day. It was disappointing that there wasn’t any stargazing scheduled for the weekend, and that other activities like the guided nature walk only took place once a week. As it was, we didn’t actually get to attend any activities during our two night stay. 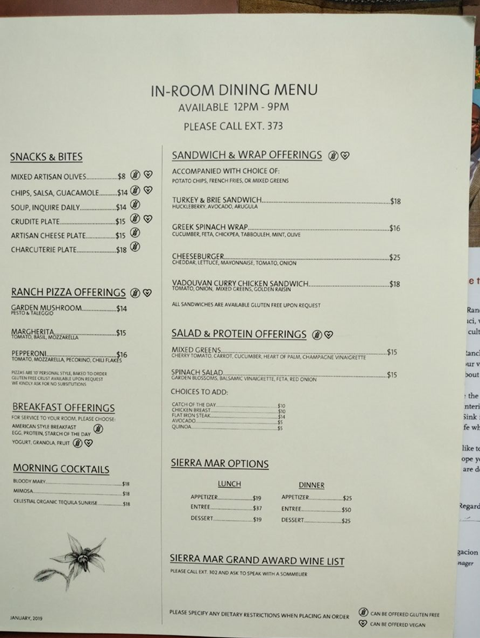 The in-room dining menu was surprisingly affordable, given where we were. Most items were under US$20, and this presented a more wallet-friendly option to dining in the restaurant. 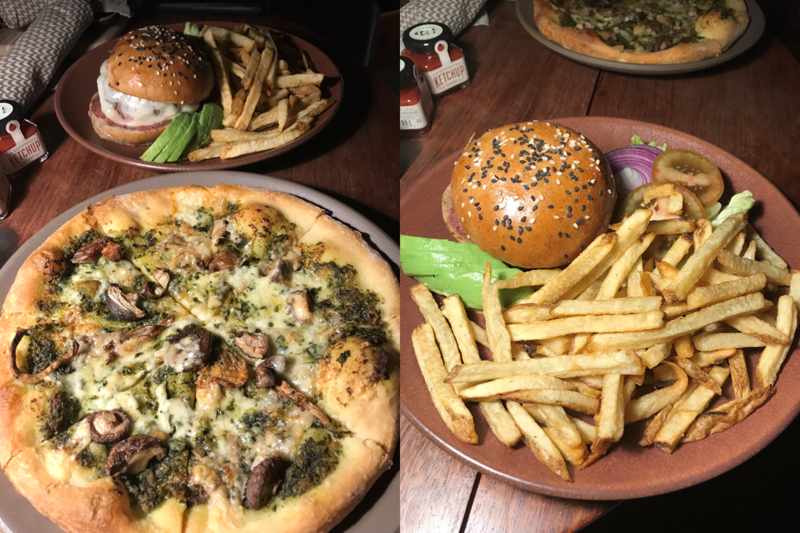 We tried the mushroom pizza and a burger on the first night. It was decent enough, although I think the Big Sur bakery near the Post Ranch Inn did a better pizza. Given that you’re in Big Sur, though, it’s hard to argue with the price. At the entrance to the room is the wet bar, which is stocked with tons of free goodies. 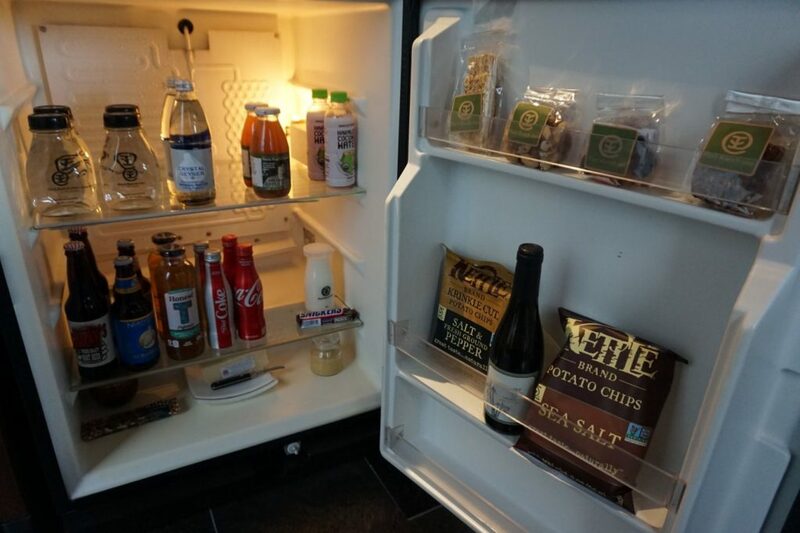 The entire mini-bar including alcohol comes free of charge. It’s a nice gesture, but perhaps expected given the astronomical room prices. 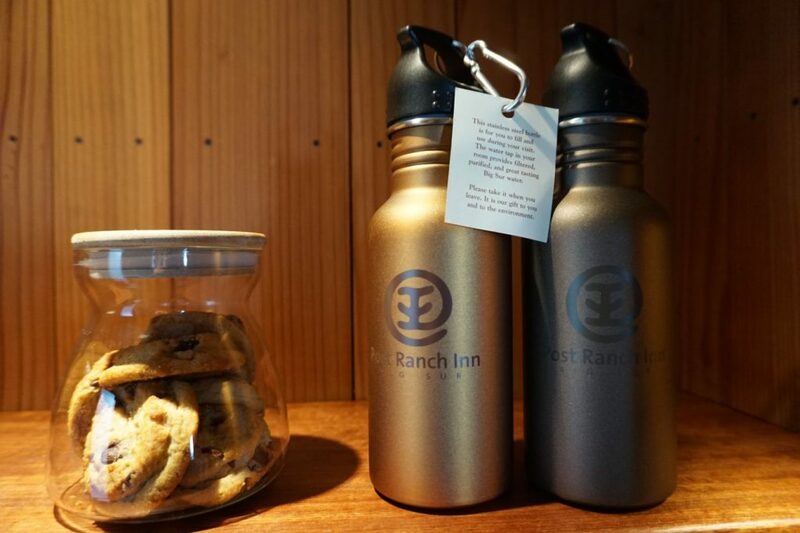 As you may have already suspected, the sustainability ethos at Post Ranch means that plastic bottles are the devil. 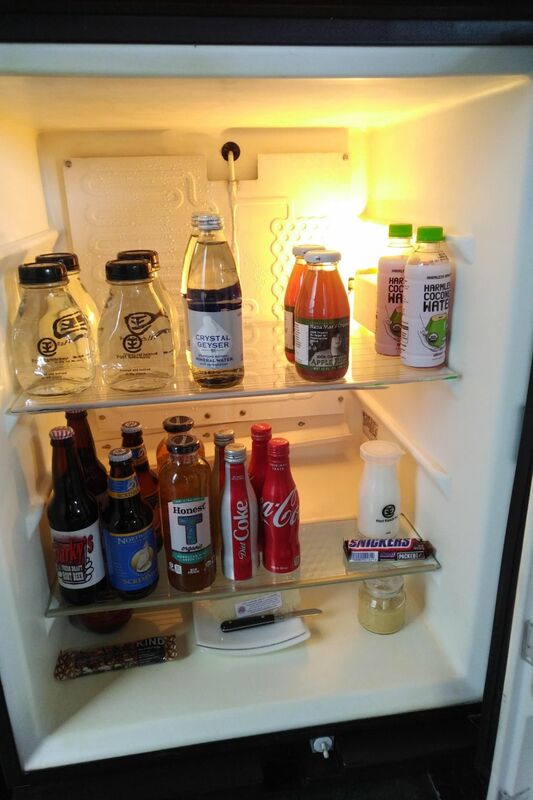 The resort provides guests with a pair of complimentary metal bottles which can be taken home after the stay. You’re encouraged to fill them with cold, refreshing water from the bathroom tap. I did think the tap water here had a very distinctive taste. Perhaps it’s the region’s blend of minerals. Or perhaps I was just being pretentious. The resort’s in-house bakery also makes chocolate chip cookies, which were chewy and instantly addictive. Fortunately, these are also replenished regularly, and never more than a phone call away. 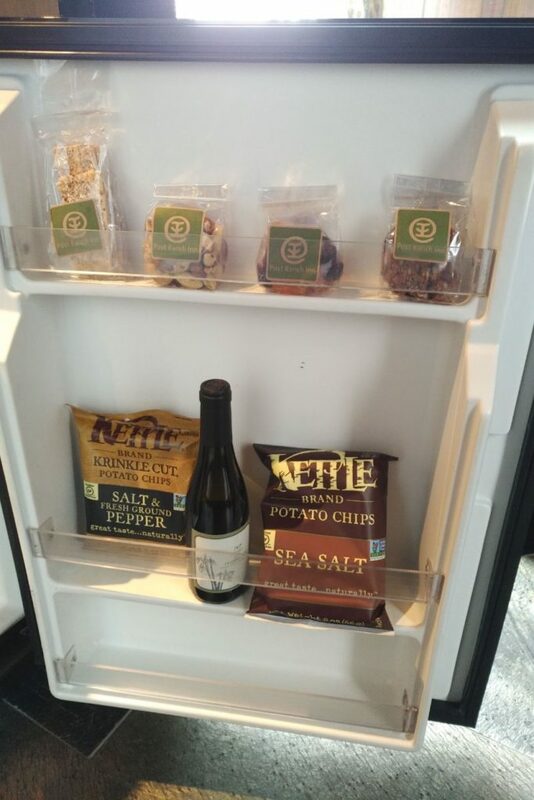 The mini-bar featured a wide variety of drinks, including a half bottle of Californian white wine (a half red could be found on the desk), more Post Ranch Inn tap water in glass bottles, the usual soft drinks, fresh milk, coconut water, and beers. Just next to the wet bar is a door to the backyard where you can sit on a recliner chair and view the mountains. On to the bathroom, which featured double sinks and plenty of counter top space. 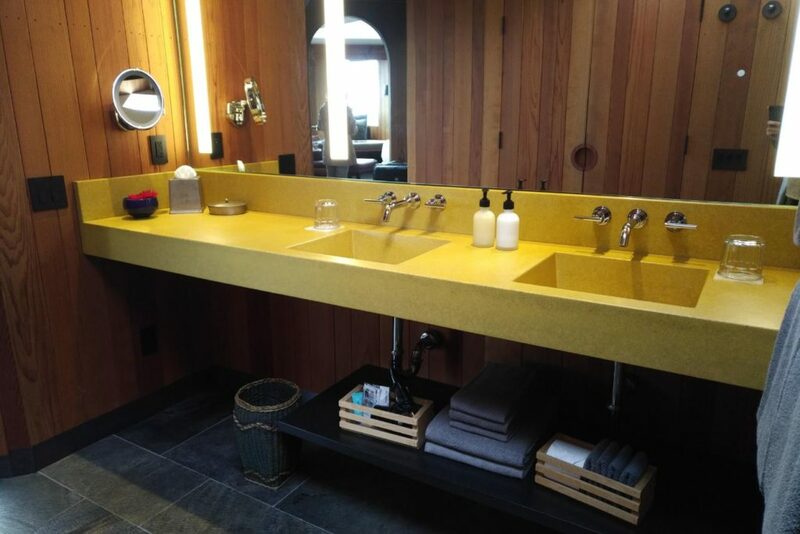 It was well stocked with towels, and Post Ranch’s own in-house bath amenities. Beneath the counter were some very useful amenities such as Coola organic (there’s that word again!) facial sunblock, a sewing kit and poison oak remover. The nature trails around the inn are safe from poison oak, but there’s always the odd guest who insists on going trampling through the undergrowth. 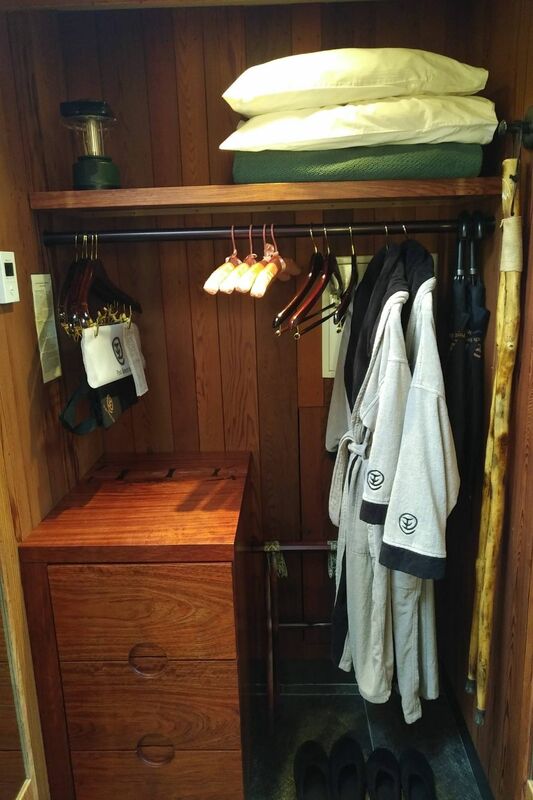 The wardrobe in the bathroom had extra pillows, bathrobes, an emergency lamp as well as two hiking sticks. Inside the wardrobe we also found a pair of binoculars and a bird-watching guide. 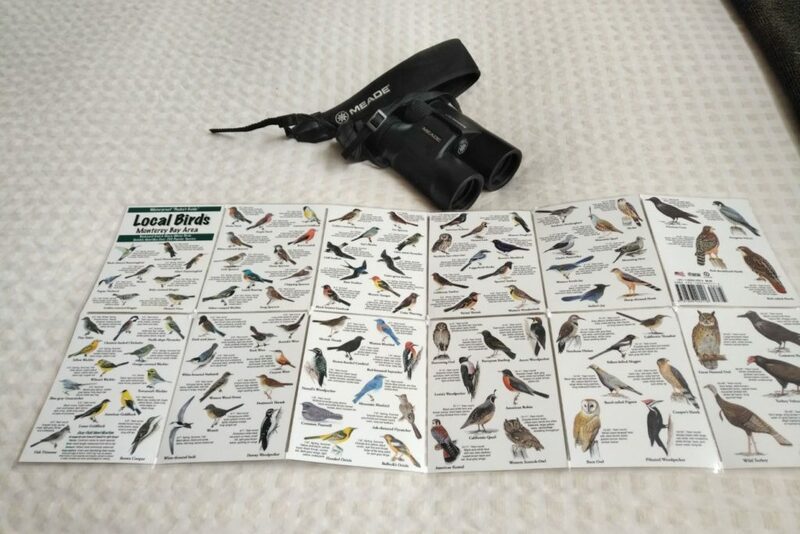 This was really useful, given the abundant wildlife in the surrounding forest (plus the occasional whale spotting opportunity from the restaurant). 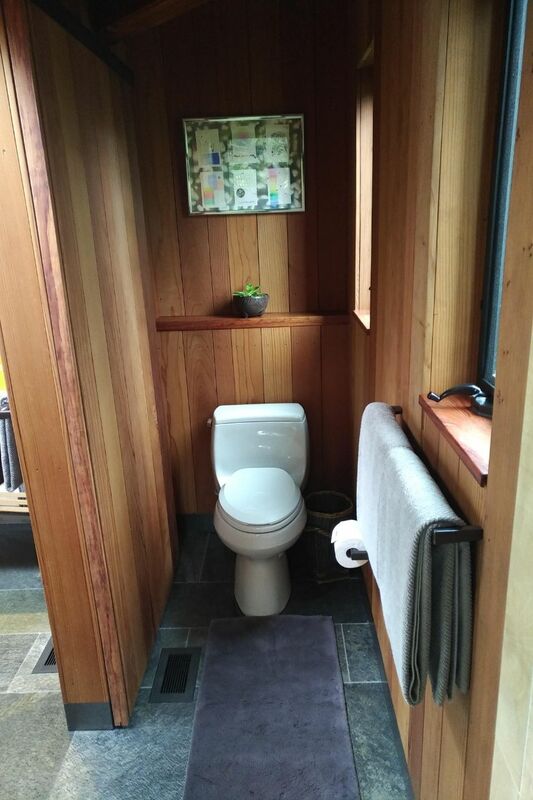 No fancy high-tech Japanese toilet, sadly, just a humble, salt-of-the-earth crapper. 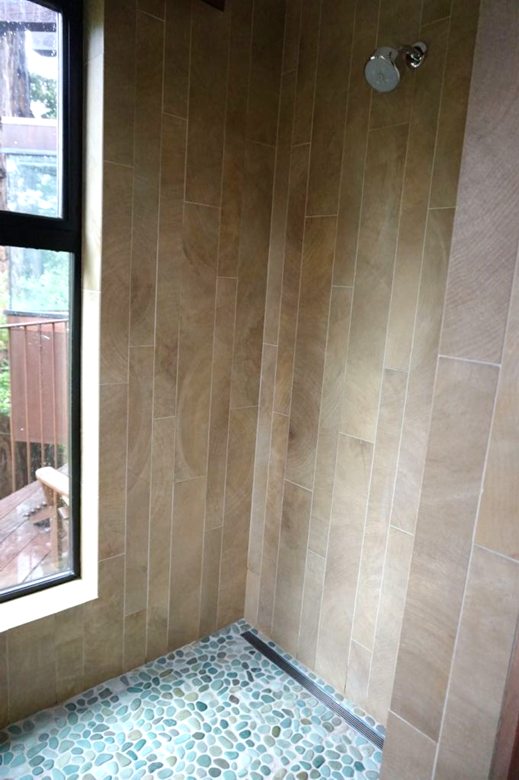 The shower featured a textured, pebble stone floor and a nook with body wash, shampoo, conditioner and bar soap. As I mentioned, the rooms were designed before rain showers became the must-have item, so you only have a wall-mounted shower head here. 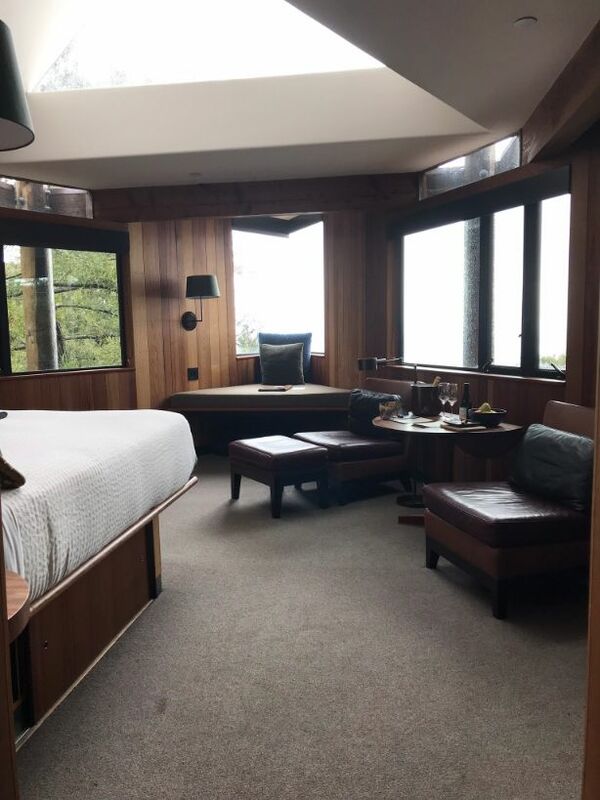 We loved the rustic charm of the room, plus the fact that we were never more than a few steps away from spectacular ocean views or the hot tubs (more on that in the next post). Some reviews have complained that the rooms at the Post Ranch Inn are dated, but I think they’re missing the point. This is not the place to come to for modern design and functionality. 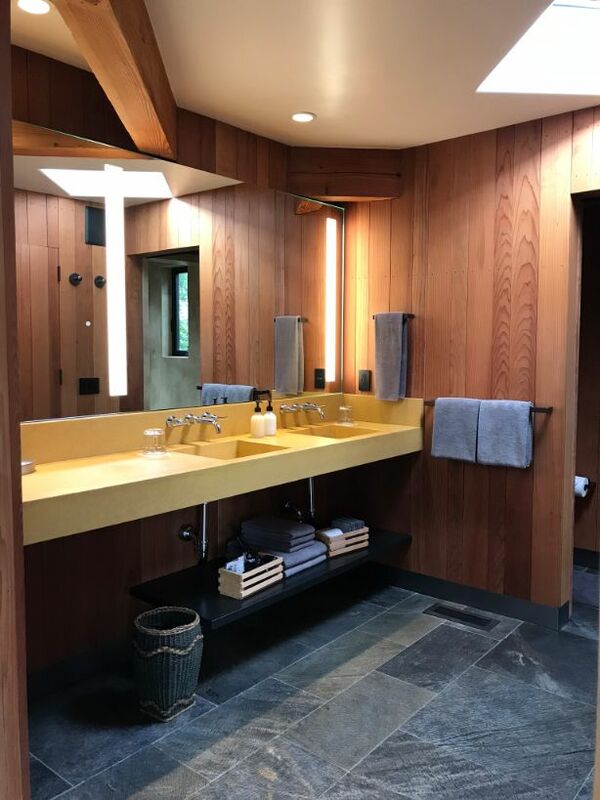 It’s a place that’s meant to evoke memories of a time when things moved more slowly, and the design is meant to blend into its natural surroundings, not stand out. 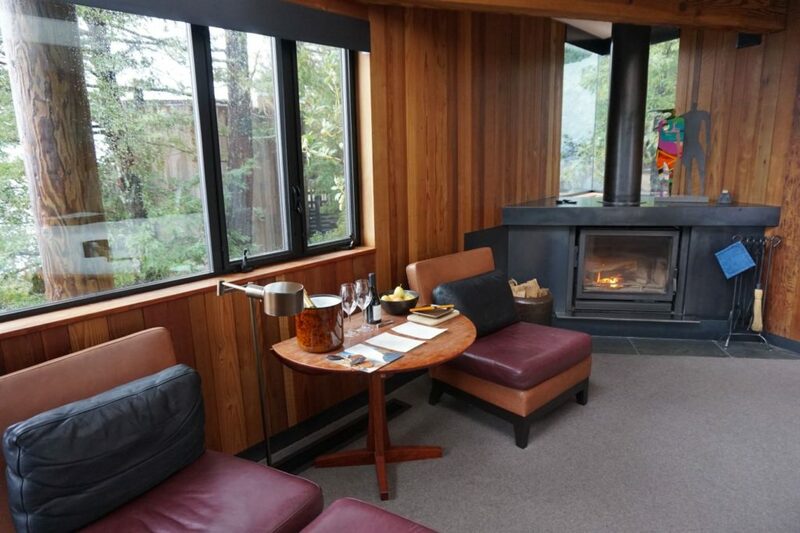 Some of the best memories were enjoying a bottle of wine by the roaring fireplace, after stealing out of the room to enjoy a brief midnight soak in the heated hot tub watching a moonlit ocean. It’s a surreal kind of experience that you won’t find anywhere else in the world. 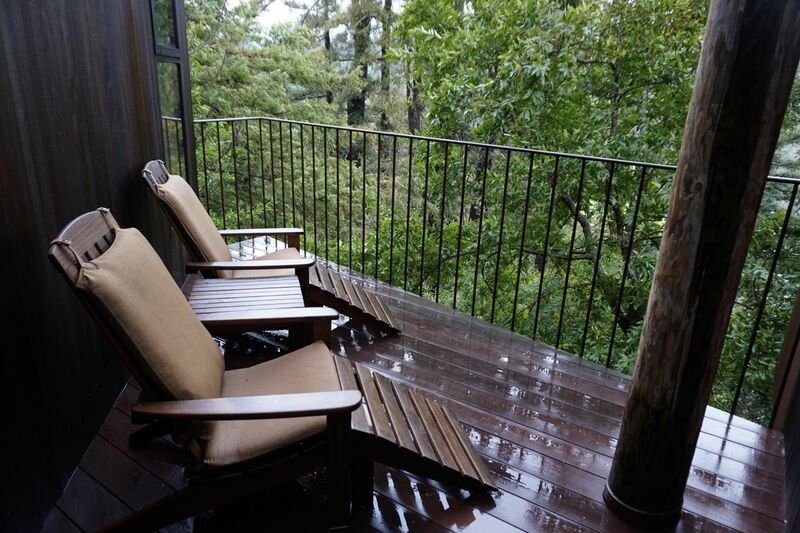 Post Ranch Inn is blessed with an awe-inspiring location and charming rooms. Those are probably worth the price of admission alone. However, what disappointed me a bit was that the service experience didn’t match the high-end positioning of the hotel. Post Ranch Inn is not a high capacity resort. There are 40 rooms, and since kids aren’t allowed you’ll have no more than 80 people in the property at one time. It doesn’t seem unreasonable to expect the staff to make an effort to memorize the names and faces of the guests, because I’ve seen this done at properties in Bali and Koh Samui with way higher capacity. That never happened here- it was always the generic “sir” and “ma’am”. It may sound like a small thing, but not knowing your guest’s names or what they look like can also lead to bigger service issues. For example, on one occasion we were exploring the spa and library area when a staff member driving by on a golf cart shouted “excuse me” at us a few times before he got our attention. He then asked if we were staying at the property. This probably happened because Sierra Mar, the hotel’s restaurant, is open to the public for reservations and it’s possible that some non-staying guests get wanderlust after lunch. 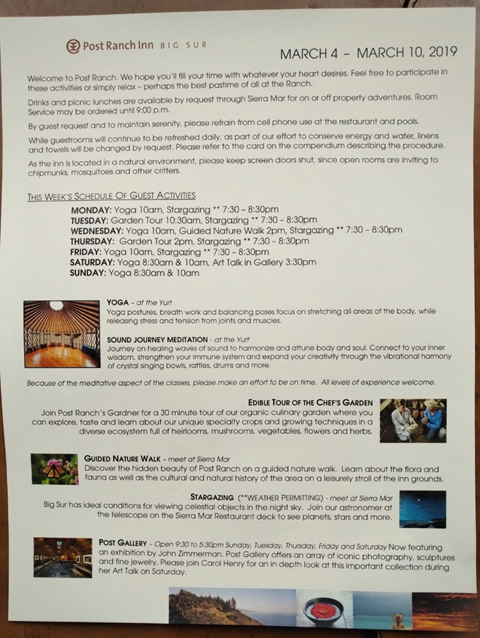 I get that the hotel is trying to protect the privacy of its residents, but this isn’t the kind of service interaction you’d expect at a US$1K+ per night resort. On another, we drove out to visit one of the nearby parks in the afternoon for a few hours. When we returned, the security guard at the entrance had no recollection of us or our vehicle. This led to a very awkward situation where I slowed down at the gantry and waited to be waved through, only for the guard to say “yes, can I help you?” It’s small incidents like that which make you feel like to the staff, you’re just another face passing through. 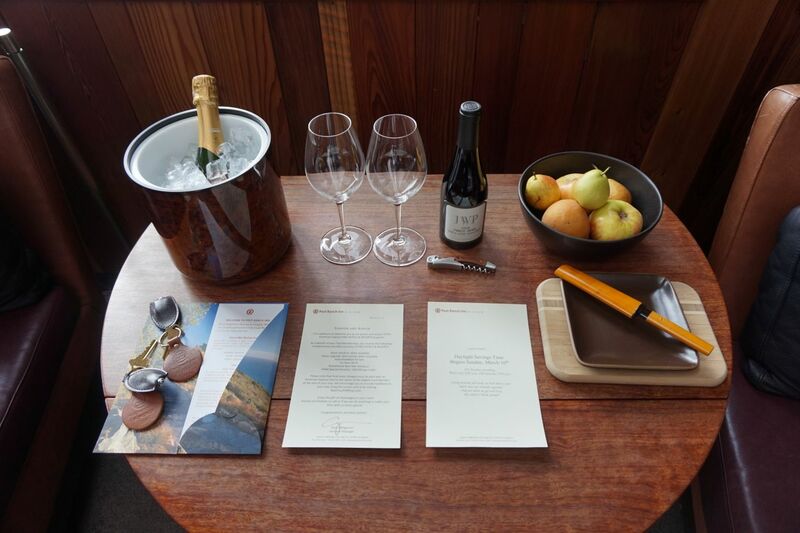 If you ask me what separates a good hotel from a great one, it’s attention to small details. I was waiting to see if the staff remembered small things, like coffee orders at breakfast or proactively providing extra firewood on the second day since we ran out on the first. No such luck. Now I’m perfectly happy to repeat my coffee order and call for more firewood. It’s just that you’d think a resort at this price point would be all over small things like that. Staff interactions also varied significantly. On the day we checked-in, the receptionist was amazing and gave us a fantastic welcome. That evening when I called down to request for ice, I was answered by another receptionist with a curt and monosyllabic voice. 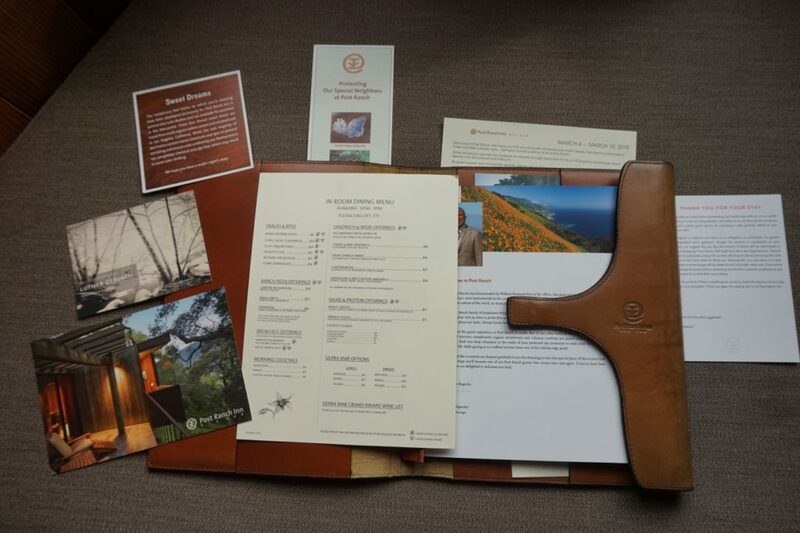 When we visited the mercantile, the lady there was so excited to share with us her favourite things about the Big Sur area and what we absolutely had to do. When we visited the art gallery, the staff member seemed distant and aloof. To be fair, the majority of the interactions were overwhelmingly positive. But in a place like this, “majority” isn’t good enough. The other issue that bothered me was housekeeping. Rooms get refreshed twice a day, one time for the regular heavy-duty cleaning, and another turn down service before bedtime. At some of the more service-oriented resorts I’ve been to, housekeeping watches to see when guests depart their rooms for breakfast so they can nip in to tidy up during that window. That way, housekeeping accommodates the schedules of the guests, not the other way round. That didn’t happen here- we’d leave for breakfast and come back to a completely untouched room, while the clearly occupied room across from us was getting serviced instead. That made very little sense to me. One particular incident that stuck with me happened during the evening turn down service. Housekeeping knocked and asked if we’d like turn down service. We said yes, and the entire three-strong team trooped into the room without removing their shoes and started working. I get that taking off your shoes in a room is more of an Asian practice than a Western one, but given the rainy conditions we were experiencing I thought it’d be common sense to make sure the floor didn’t get wet. At least you’d think housekeeping would take their cue from the guests in the room- if they saw shoes on, they should keep their shoes on. If they see shoes off, then they should mirror it. 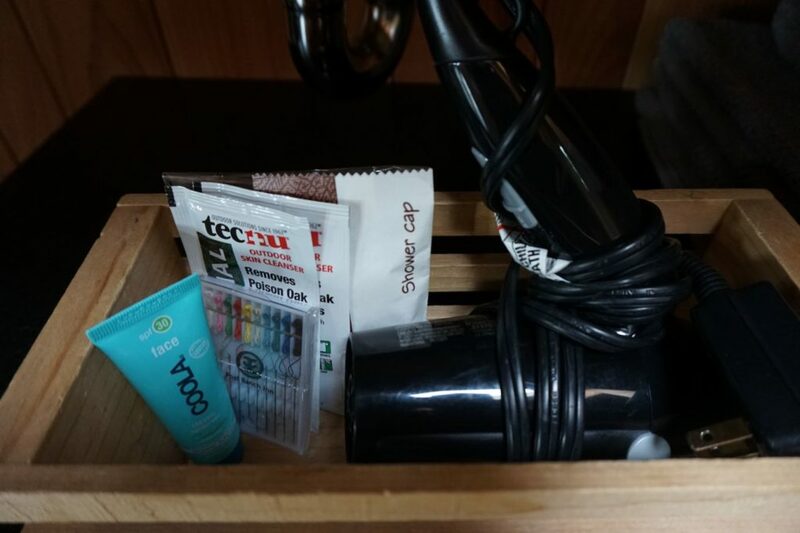 This wasn’t just the housekeeping staff- I observed the same thing with room service and when staff arrived to attend to miscellaneous request. Day cushions in red. You don’t want to know where these have been! 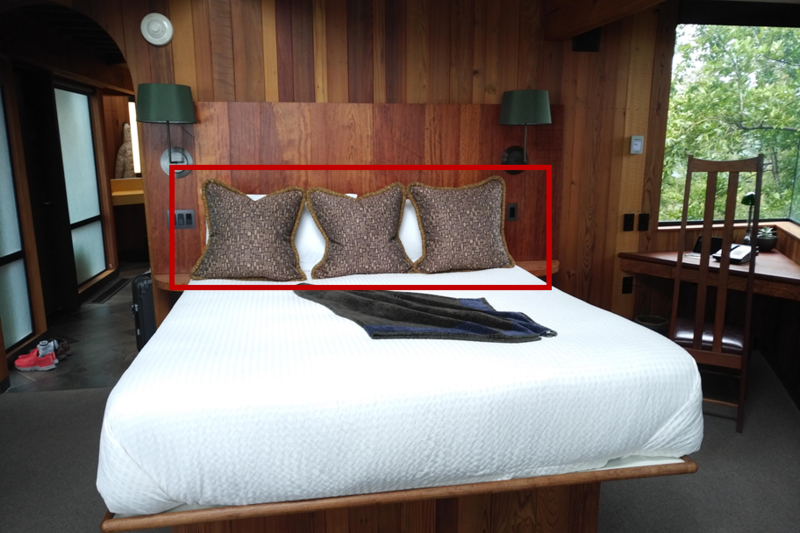 During the turn down service, it was also a bit disconcerting to see the staff strip the day pillows from the bed and chuck them into a storage compartment beneath it. This meant the same pillows that rest on the bed in the day have been lying on the floor all night. Did either of these issues wreck the stay? Hardly. The point I’m trying to make is that when you compete at this end of the market, service interactions need to be flawless, and sadly that’s not what happened. In my next couple of posts I’ll take about the facilities, activities and dining available at the Post Ranch Inn. An interesting post. I wonder how are the service standards in this type of high end ‘hotel’ service standards compared to similar sites in the US? Does anybody else have experiences that they have and share? it’s funny because you’d think that in a service culture like the US which is heavily tip-driven, hospitality staff would make the extra effort. and yet I tend to find service better in countries where tipping isn’t expected like Japan or resorts in Thailand/Indonesia. I haven’t really stayed at any US property which I’ll describe as having over the top service, come to think of it. the best service i’ve ever experienced has been at the ritz carlton bangalore, the st regis bali and the vana belle koh samui. Mandatory tipping doesn’t lead to good service culture. That said, how much gratuities or tips did you leave with your experience? 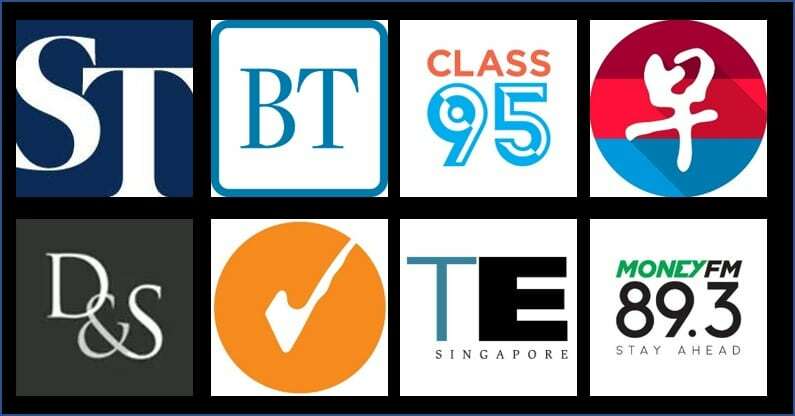 The recommended US$25 per day or less or more? I gave the recommended amount. Unsurprising given it’s USA. They don’t exactly have their focus as making service great again. I would never return to a property if I experienced such issues as the MIlelion described – these would definitely be considered stay-wreckers. Especially one at that price point. If I had been shouted at by that person in a golf cart, I’d pretend I never heard him. See what happens next, maybe another United Airlines saga. LOL. The response to the customer’s complaint is so typical of American fluff. Complete BS. Lucky for the Milelion – I know now never to stay at this place. Service and price are somewhat related. I hope you are not making the argument that for less well travelled people, we can expect them to find being shouted at the norm? I once got shouted at by a (obviously racist) Swiss German at Jungfraujoch who wrongly assumed I had no ticket. That scum had the gall to confront me and continued shouting – it didn’t end well for him. Nice place. Like you said the idea is to blend into the environment, get out of tech n be with nature. Glad you are having a great time. Thank you for foraging ahead and reviewing this property. Having seen the pictures of the room (and bathroom) and the cloudy sea view, I think I would prefer to try out the property next door. The dated design, coupled with the mediocre service just cannot justify that price point for me.